From foundations and slabs to decorative patios and walkways, Hutch Brothers Concrete provides our clients with superior concrete work. Here at Hutch Brothers Concrete we are also your main local source for insulating concrete forms (ICF’s). Hutch Brothers Concrete Corp. is a full service concrete contractor specializing in residential foundations of any shape and size. 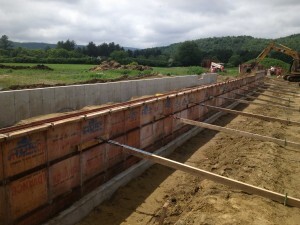 You can rely on us to consider all aspects of your foundation, from the footings to the walls, rebar, and slabs for all designs including circular or octagonal foundations. Footings/ foundations/ forms – We build the project form work according to the plan and site conditions, and we set elevations with our total station and lazers. We consider all aspects of our work. Efficiency is key. We efficiently mobilize and supply our crews, as well as ensure there is sufficient man power on the job site. We coordinate with other trades and with sequencing your project, and HBCC prides ourselves on holding high safety standards, job site etiquette, and cleaning up when we’re finished. Concrete literally serves as the foundation for America. Concrete is in our homes, business, schools, and offices. We all come in contact with concrete on a daily basis. 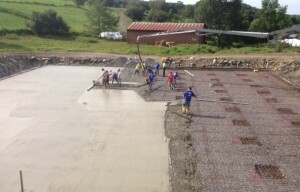 Hutch Brothers Concrete Corp. has proudly served Central Vermont since 2002. We pride ourselves on the strong relationships we have built with numerous general contractors. Footings/ foundations/ forms – We build the project form work according to the plan and site conditions, and we set elevations with our total station lazers. We consider all aspects of our work. Efficiency is key. We efficiently mobilize and supply our crews, as well as ensure there is sufficient man power on the job site. We coordinate with other trades and with sequencing your project, and HBCC prides ourselves on holding high safety standards, job site etiquette, and cleaning up when we’re finished. We also pride ourselves on our ability to provide quality repair work as well by fixing a variety of common problems that occur when concrete ages. We look forward to working with you on your next commercial project no matter what the size or scope of work. 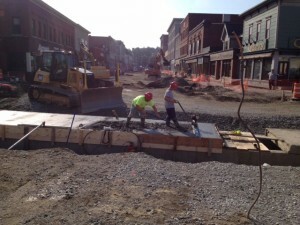 From Barre City’s Big Dig project that spanned over 3 years to new health care facilities, walkways and handicap ramps at schools or other places of business, to various projects for the State of Vermont, we are here to service your municipal concrete needs. We offer quality workmanship from foundations to additions, sidewalks, ramps, loading docks, granite and concrete curbs, and much more. We can service the most rural municipal needs such as excavation and slabs for new composting toilets for the convenience of bird watchers in Chelsea. We look forward to working with you on your next municipal project no matter what the size or scope of work. From expansive goat and dairy barns to moderate and small horse stables we are here to service your agricultural concrete needs. Footings/ foundations/ forms – We build the project form work according to the plan and site conditions, and we set elevations with our total station lazers. We consider all aspects of our work. Efficiency is key. We efficiently mobilize and supply our crews, as well as ensure there is sufficient man power on the job site. We coordinate with other trades and with sequencing your project, and HBCC prides ourselves on holding high safety standards, job site etiquette, and cleaning up when we’re finished. We look forward to working with you on your next agricultural project no matter what the size or scope of work. Quality concrete flat work is achieved in 4 core steps: Reinforce, Pour, Place, Finish. This is a craft that our special finishing team excels at. 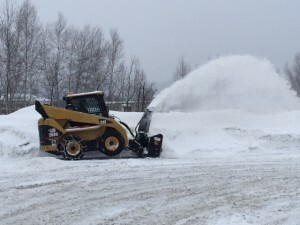 Reinforcement is key, especially given our extreme Vermont winters. We know what to do so your investment won’t crack or heave from frost exposure. We offer a variety of finishes including broom finish, hand trowel, power trowel, stained, and stamped. We will provide you with a quality finish with attention to fine detail. 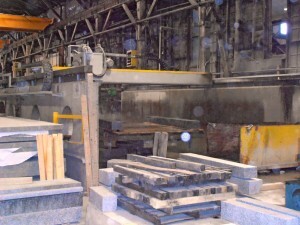 Post placement we offer saw cut control joints and industrial sealers to protect your investment from the elements. We invite you to view our galleries for some examples of our award winning flatwork, and we look forward to working with you on your next project no matter what the square footage. 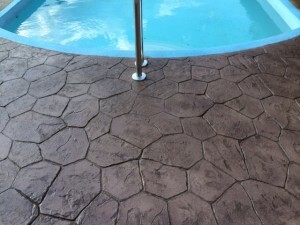 There are endless options when it comes to stamped and decorative concrete techniques including adding beautiful impressions, colors and other effects, and we have a specially trained finishing crew to handle these projects. So what is stamped concrete? It is the process of adding texture and color to concrete to make it resemble stone, brick, cobblestone, slate, and wood to name a few. The endless pattern and color choices makes stamped concrete an easy choice for new construction and renovations. We offer decorative and stamped concrete walkways, patios, sidewalks, as well as interior projects. We invite you to view our galleries for some examples of our award winning decorative concrete work, and we look forward to working with you on your next commercial or residential decorative concrete project no matter what the square footage.